Any coach would LOVE to take up the managerial job of the French National Squad. Forget coach, any football loving individual would love to do it. I’d love to do it, and I’m sure I will do a better job than Raymond Domenech. They have definitely got one of the best squads that I’ve ever seen. Some people might be pissed off that Benzema hasn’t been given a call, but then again, he hasn’t exactly had a good season with Real Madrid either has he. He’s been relegated to the bench and rightfully so, with Higuain scoring so many goals. I’m not sure as to why Sidney Govou is in the team instead of Benzema. In Hugo Lloris, they have a fantastic goalkeeper, who some may say single handedly knocked Madrid out of the Champions League. They have Patrice Evra, who has had a fantastic season for Manchester United and is a terror on the left flank. This is assuming that Domenech doesn’t pull a Domenech and play Abidal in that position instead of Evra. Although, we don’t really need to worry about that because Domenech has pulled another trick out of his bag by playing Abidal as centre back along with William Gallas. This is probably the reason France have been unable to keep a clean sheet in their friendlies. 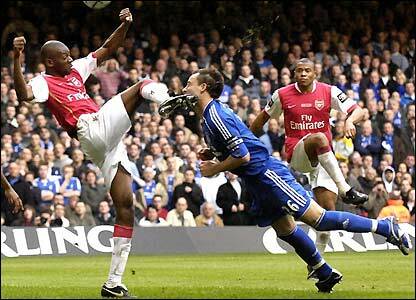 Squillaci is a centre back and has been playing that role for a while, so why not try him out there, Raymond? Sagna who’s had a very indifferent season will most likely start on the right. They also have Reveillere for the right back slot, a more attacking player for that position. Domenech is most likely going to play a 4-3-3. This is a very attacking formation and is better than the 4-2-3-1 that he played against Costa Rica et al where the team struggled. 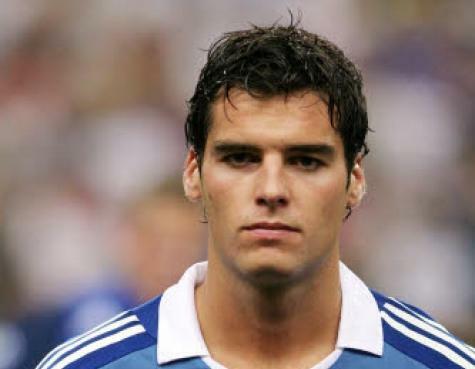 Gourcuff will definitely start as playmaker for the French as he is considered the natural successor to Zinedine Zidane (poor Gourcuff, I don’t know how he’ll live up to that). He’s a good player, but I don’t know who will play in that role if (god forbid) something should happen to him. Malouda is also going to play in the midfield instead of his preferred position on the left of the attacking three. This is where he usually plays for Chelsea and he has excelled in this role. Jeremy Toulalan is most likely going to play the holding role in midfield. 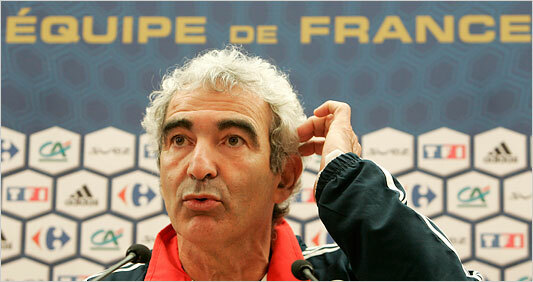 Domenech is most likely going to play the combination of Ribery, Anelka and Govou up front. This will not work for the simple reason that Anelka likes to drift into midfield and pick up balls which means that the wingers will have no Blue Shirt (or White, depending on which one they wear) to aim for in the middle. Okay, so what are the other options, now that we know Benzema is not one? Gignac? In 2008-09, from 38 appearances he scored 24 goals and had 5 assists. In 2009-10 he made 31 appearances and scored 8 goals and had 4 assists (according to Wiki, he was still top scorer for Toulouse). It isn’t a great record especially since playing he plays in the French league which (no disrespect to the French League) isn’t as competitive as Spain, England, Germany or Italy. I think he might do okay, if all you need is someone to hold the ball and play it on to your fellow strikers and midfielders who arrive late, but I’m not so sure whether he’ll work as an out and out target man, a poacher who picks up everything in the box and given two chances will convert one. Cisse is another option for Domenech. The Panathanaikos man has scored 20 plus goals for the Greek club in the previous season. He’s okay, but isn’t world class either. Valbuena is an option as well, but I’m not really sure how well he would perform if you just threw him into the World Cup like that. All those who want to see Henry play a major role in this tournament will be disappointed because as far as Domenech (although we know that Guardiola agrees with him on this one) is concerned he’s past his prime. He’s going to be reduced to a bit part player. "Alright, Hugo, you play as striker, let's see if that works"
The biggest mistake that Domenech made was to keep playing the same 3 up front in all their friendlies and expecting a miracle. He should’ve tried a different three to test each line up’s efficiency. Truth be told, I’m pretty sure he’ll still go ahead with the same three that played all the friendlies and failed to deliver. That, my friends, is the brilliance of Raymond Domenech and perhaps the single reason that France will not do will this World Cup. No, only joking. I’m not so sure if they will get out of their group stage. Uruguay is a good team, so is Mexico. They should beat South Africa. Nonetheless, with the talent that they have, they had better make it out of the group stages, else it is quite an embarrassment. Maybe they’ll finish two in the group stages and then we’ll have, in the first knock out round, the Battle of the Clueless Managers between Domenech and Maradona. Realistic prediction – first knock out round, although I hope their squad surprises me, because they’re nice to watch when in full flow.